A rebuild can be rough for sensitive hearts like me. The aggregate conversation that takes place in Rangerstown shifts from where it usually is in good times. From exciting highlight-reel plays that took place earlier in the week and excitement for big matchups ahead, to grim prognostication as to how everything could go horribly horribly wrong. Lias Andersson instead of Casey Mittelstadt? No top-five picks? Marc Staal? Still? I recently did a series of posts on worst-case scenarios that I could think of, and you better believe that there’s plenty more of them kicking around in my head, but I want to make sure the point I was trying to make is clear. The simple idea here is that it’s all a matter of how you look at it. There’s plenty to be excited about, plenty of reason to be optimistic. There’s no doomsday situation that can’t be avoided or ameliorated, and the notion that the Rangers are on the edge of utter catastrophe is a bit out of hand, I’d say. It might be tough to hit the best possible outcome, a long multi-championship dynasty that blows us all out of the water beyond every possible expectation, but even if we land somewhere in the good-to-pretty-good spectrum we’ve still got a shot at something special. If there’s one thing that this Henrik Lundqvist era has taught me, it’s that you learn to appreciate every game, every playoff series, every memory that can never be erased. It goes without saying too that once you’re in the playoffs anything can happen – the Caps won it somehow last year after years of much better Washington iterations failing miserably. Obviously there’s going to be teams like this year’s Tampa Bay Lightning that make it seem daunting, but check in on the fanciest of odds-making and you’ll find that they’ve got around a 20% shot at winning it all, while the worst playoff teams have somewhere around a 5% chance. If I told you there was a 5% chance you’d win the lottery would you do it? Would you keep doing it, especially if the journey to alleged disappoint was actually pretty entertaining? To address the issue of whether we’re Philippe Petit or actually on terra firma head on, let me first say that reasonable people can always disagree, reasonably. Still, there’s certain questions raised by naysaying, certain values and priorities betrayed by advancing tales of apocalypse, and at heart an inability to appreciate what we’re lucky to have in our lives one way or another. Why do we feel the need to monopolize “honesty” as an inherently grim stance? Why would we rather get it right on how things went wrong? Why can’t we just enjoy hockey, one way or another? Perhaps I’m being uncharitable in my worldview. Blind optimism is no better than deep-seeded cynicism, but the Rangers are doing everything they can to make the most of their situation and put the team back on the road to contention. I am confident that solutions to issues are being worked on tirelessly in the Rangers front office, that Marc Staal’s contract can in fact be moved (whatever happened to Dion Phaneuf? ), that the wide-ranging focus on defensive prospects (DeAngelo, Pionk, Miller, Hajek, Rykov, Lundkvist – hold up, that’s six isn’t it? ), and that the risks Jeff Gorton has been taking on a regular basis will either pay off or be easily mitigated. It didn’t happen this season. We knew this. That’s actually a good thing though, no? Wouldn’t we rather totally waste a season when we were anticipating doing exactly that, rather than be stuck in some delusional state where we’re all in on contending and then woops, actually the team has deep structural issues? If the guys we’re staking our team’s future on are going to have bad seasons, let it be now so they can get the wiggles out, and when it’s time to really burn up this league it turns out they’ve been simmering this whole time. The Rangers have a clear strategy of letting things get bad, throwing as much as possible at the wall, and checking out what sticks in a couple of seasons. Shouldn’t that be exactly the kind of self-awareness we want out of Jeff Gorton? There’s the elephant in the room of our awful defense. It’s true, they’re bad. But that ties into my last point – we picked now to be bad. If we were contending and this current version of Marc Staal were out there constantly, yeah I’d be mad about it. But it’s honestly fine despite how frustrating he can be at times knowing his contract is an albatross. Rome wasn’t built in a day, and if you think the brain trust hasn’t been working on a way to move him I don’t know what to tell you. These things take time, teams’ perspectives change, and deals can always be struck. It might not be an ideal trade, but it seems more likely than not that he’s gone sooner rather than later. Buying him out would be bad, but not that bad. Be patient though, because freaking out about it can’t help, but will hurt. Ditto for Brendan Smith. Now, we’ve also got an allegedly-bad defenseman in Kevin Shattenkirk clogging up our defensive depth chart right? Sure, it was a strangely timed UFA signing, and he hasn’t turned into the number-one guy we all hoped he would be. But he’s fundamentally a good player, and if the Rangers find a team looking to take it to the next level, are willing to retain salary (they should), and have the right targets in mind, then there could be a pretty nice return. I will be bummed to see him go, given the hometown connection, but if it’s what needs to be done and the front office handles it correctly, it’ll be for the best. So that’s three whole roster spots on defense we’ve opened up, and a fairly sizable stock of very promising young d-men. That certainly looks to me like it’ll be more than enough to turn into an effective defensive group, one potentially buttressed by living legend Erik Karlsson, should the Rangers successfully sign him. When your worst blueliner is Brady Skjei potentially, you’ve got a good group. Nothing to be upset about there, it just isn’t tomorrow yet. Ok, fine. Watch some baseball, check out some NCAA and overseas highlights, and just wait. It’ll be more than just alright, I promise. More generally there’s the risks Jeff Gorton has been taking throughout this rebuild that show a certain posture towards high-reward scenarios. Starting with the Stepan trade, he ran the chance that DeAngelo would be one-dimensional or that his attitude would hinder his potential. Obviously Quinn has had to bench him a couple of times, but Quinn has been doing so liberally up and down the lineup, and Tony D seems to be actually pretty responsive and well-adjusted in his reaction to it. Lias Andersson was the second half of that trade, and despite most fans looking at him through the lens of disappointment, again, patience is the trick here. He may not turn out to be an elite guy, but if you surround him with other good players it’ll all turn out fine. Even if he maxes out at Derek Stepan, then you’ve got a player you can build a team around, and yes, you can build a team around that kind of player (we actually did it, and it worked pretty well, and we almost won the Cup that way). That same draft the Rangers also selected Filip Chytil, a potential steal who is looking like a better and better idea every day. Just wait until he hits his stride and has a breakout season. We liquidated our assets last deadline and did so again this deadline, and picked up some guys who at first blush may not seem exceptional, but a bunch of them all together could build a formidable team. Quantity over quality is not as bad of a strategy as it may seem, and in fact might be the better road to take. Eventually, someone is going to turn into an exceptional talent, maybe even an elite player. So if we keep stepping back up to the plate and swinging for the fences, I’m optimistic that we’ll hit a few out of the park and then build around a new core the way every other team does. Signing a guy like Jake Elmer is a great move – it cost literally nothing but an ELC and a roster spot. I mean, it can’t be as ridiculous as taking a flyer on a guy who came from a country that had produced next to no good hockey players ever, had one decent Olympics, and had to go back to the KHL to hone his skills for a bit before maturing into a three-zone monster who could shift the tides of any given game through a combination of skill and pure hustle. What I’m getting at is that the Rangers are leaving no stone left unturned as far as building a new roster goes, and that’s something to be excited about. Would I have liked Nic Petan over Brendan Lemieux? I guess, but I’m more than positive it won’t be what decides the success of this rebuild. Lastly, we took a big risk on David Quinn, and it’s important not to forget that. You might have some minor gripes over who’s scratched when, but he’s been pretty open and transparent about what he’s been working to accomplish with this team and how he’s going about it. If you can’t vibe with that after the pendulum swings of both AV and Torts I don’t know what to tell you – it probably says more about your perception as a fan than it does about DQ as a coach. Right now there’s little to go off of as far as what we’re going to be looking at two years from now as far as lineup decisions, deployment, and strategy. Quinn is taking what we’ve got out right now for a test drive, knowing full well that this car is coming out of the shop looking vastly different every season over the course of his contract. It’s a bit weird, I’ll admit, to say that we’re not unicycling on the edge of the Grand Canyon at the same time as we’re taking a bunch of risks. This isn’t a contradiction in terms though, because what we’ve been doing for a while now is loading up on weighted dice. Not all of them are going to roll in our favor, and in fact some of them will inevitably come up the wrong way. Some of them won’t though, and that’s going to happen enough times to give us a new core of players who can be the foundation of several new contending Rangers teams over the course of a long period of time. There are, I’m confident, Plans A-Z, lessons learned from the past, and ample reasons for optimism. Patience though folks, because these Rangers aren’t on the brink of total failure. Quite the opposite, they’re warming up for a huge leap forward, and it’s looking like a solid bet that it’ll go our way. "Teetering On The Brink? Not Exactly: A Doomsday Wrapup", 4 out of 5 based on 22 ratings. Karlsson? Just say no. Really. Amen Peter, the guy is shot, undersized, fragile, and would cost a fortune, for years to come. Stay away from him as if he had the plague………. If we were one d’man away from a SC and he’s the answer, sure take a shot at it … but we’re nowhere close, Very hard PASS. Karlsson (in the peak of his peak) on the 4th best team in the league is 5th in +/- of all the defencemen on the team. He’s a high event player at both ends who literally barely moves the needle. On the Rangers his stats would be like they were in Ottawa: decent points, a little to a lot under 50% GF% and it will only get worse over time. Not only no, but no effing way. Vancouver, and the Ducks both won last night, along with Buffalo, so now we are the #6 spot in the draft positioning, tied with the Ducks for points. We could be in the top five, possibly top four soon, and we could be a lottery team. With all that talent available, we sure will get a quality player this year. I signed up for a rebuild, and still support it very much. I will give the Andersson kid time to develop, along with all the draft picks over the last two seasons. I’ convinced that we are on the right path, and will be a team to be reckoned with in the not so distant future. Every team that won a cup over the last number of years have built their team thru the draft. The Kings, Hawks, Pens, Bruins, Caps, all did it that way. We have the Jets, and Preds that are on the cusp all drafted well. Bottom line, we will never win a cup trying to buy it. Teams like Filthadelphia has for years tried to win that way, and always come up a day late, and a dollar short. Ed Snyder was a very impatient man, with deep pockets, who wanted to win now, at all costs, but couldn’t replicate the 74-75 seasons. The future will be bright, stay the course, support the rebuild, and stop the carp about these kids being duds. They have to learn to walk before they can run, and run they will. If it takes another year of poor play, so be it, this to shall pass. Once we have the foundation of good young kids, then we can address the veteran presence in the locker room. I suspect that management has a long term plan with this in mind. I would prefer they trade for these players, rather that sign UFA, who never seem to pan out in the long term. I don’t want to sound Pollyanna, but this is the best way forward. I’m in your corner, Kakko is my man!!!!!!!!!! i’d 3rd that with both of you..would love to see Kakko as a Ranger! Our team needs a resurgence of life. Sure we have some young players, but we need really good players, not just nice middle 6 guys. I think we are trying to draft top players, but we need a few superstars. We know that the Zinbad line needs the support of at least 2 more strong lines. Hopefully Howden and Chytil can be part of that middle 6 that lights the lamp often. Maybe we get a top 4 pick that needs only half a year in the AHL before becoming a stud. Lots of maybes. On the defensive side, as stated previously, we need 3 new good faces back there. You can get by with Skjei and Tony D, but the rest of the guys need to play bottom 6 minutes. That means you bring in a strong pair of guys who know how to play a system and protect the slot. Who they are, and how they get here is a mystery. I also think the time for Krieder to go has arrived. If you can get another good young player and a 1st rounder for him, I think you have to do it. Losing is wearing him down. As for Lias, I can wait one more year, but if he doesn’t show NHL qualities next year, he is Jesiman to me. agreed on everything but your comment on Kreider. I don’t think anyone looks particularly good right now and I don’t really expect them to. cant really judge based on these final twenty or ten. if you trade him you need to have somehow ready to take 200 shots bc right now no one is even close. Agent you make a good point, but; a true leader steps up when things get tough and works their way through it. And shows his team mates the way forward. I know it’s not easy what they are going through, but do we want results or excuses? I think we all want results. Zucc had a tough go of it for a while, but he pulled himself together. I am generally a supporter of Kreider. However; after seeing him these past 7 games or so I would hold off on making him Captain. And I’d think twice about that next contract. Suddenly $6 to $7 mill per seems a bit expensive. 6 isn’t really. 7 I’d probably agree with you . so prob somewhere in middle is the settlement. esp if a lot of their top prospects are passing guys they do need guys who are more finishers, even if kreider will never be an 70/80/90 point guy. Kreider and Zib have not been so great since the Zucc trade. Shows you what chemistry means in this game. In addition, Hayes was traded, so we lost 2 of the 6 top players on top two lines – reasons we have been losing a lot. Our defense stinks also, we all know that. Management makes mistakes signing D to long term deals. Learning lessons. Don’t agree (yet) on Krieder, but the first 20 games next year, may make the difference. Lias needs to show more promise than he has so far. It’s a rebuild Sal, let’s get rid of this one dimensional hockey player that has some size. Let’s face it Kreider is what he is, he’s past the point of “high hopes”. Going into next season a few GM’s may need to save their job and may be willing to give a haul up for him. If not, so be it. I like what Gorton is doing, while I don’t believe he has complete autonomy, I think he is in charge. And I also believe, just as Pat states, he is totally aware of the $hit$ticks that play on this defense. The McLeod trade, while minor in scope, subtly told Quinn JG’s the boss. So guys like Pionk and Staal may not be the main players going forward as their playing time suggests. I feel he has a plan, and while I’m not getting any younger, it’s gonna take time. want no part of karlsson. just because they’ll have cap space doesn’t mean they HAVE to use it, just because media expects it. look at all the bad contracts on defense that will take 2 more years to shed. its not the NFL where u can just cut guys. NHL free agency is where you go to buy used cars – steer clear. A rebuild means a teardown and acquiring players that can help your team be great again. We have sold our good players and replaced them with young players who can’t even tie the skates of the guys they were traded for. This is a doomsday scenario, as there is yet to be light at the end of a very long tunnel. We are 2-3 years away from contending for even a playoff seat. Nice article, Pat. This is the course I have chosen to take as well. Patience. You are absolutely right Walt. And for us that is the good news/bad news scenario. The good news is we could potentially have four #1’s this year. Not likely, but possible. Three is certainly realistic though. The bad news is our draft history is not good and our talent evaluation is no better. IMO this is a make or break draft for us. And to me the front office, in particular Gordie, is the weak link in our rebuild. And putting our future success on Gordie is very, very scary. I just don’t have the confidence in him making pragmatic selections. I would think that a feature on the front office would be a good topic for the status of the rebuild focus. But apparently not. I agree on a make or break draft. We need real top 6 help out of this draft and those picks are usually in the top 10. Let’s hope we do not go off the charts with a pick at 3-6. I think Quinn is the right guy for this job, but he currently needs to stop practicing and let the guys breathe. We need a few things to happen for us to contend – Zibby & Krieder need to play their best hockey. Buch needs to be the guy we always expected. Kraftsov needs to be a top 6 forward and Chytil/Howden/Andersson need to all play better. Vesey and Lemieux could be nice 3rd line players, but they need to score more. Our defense needs help – lots of it. Not too sure we can clean up this mess in one year. Our draft history falls somewhere in the middle of the pack. This idea that we’re bad at drafting has taken on a life of its’ own over the years. Aside from the Bruins all those teams had multiple Top 3 picks — and the Bruins’ SC team was largely built by Jeff Gorton! Even a blind hockey fan (no offense to blind people everywhere) could have drafted Kane, Toews, Ovechkin, Malkin, Crosby, Doughty, etc. Sorry, but don’t color me impressed by teams that pick over and over again in the Top 10, Top 5, etc. and then have success. I’m even less impressed by teams like Carolina, Edmonton, Buffalo, etc. that keep drafting low year after year and can’t even build a team that contends. For almost a decade we were one of the best teams in the NHL, that doesn’t happen because you draft poorly year after year or because you can’t identify good hockey players. 2019? With all the draft picks, should be top 3. Best case: Four 1st round picks; 5 of the first 37(or so). Worst case: Two 1st rounders; 5 of the first 62. Most likely? : Three 1st rounders; 5 of the first 47 (or so). Patience. This is how you rebuild a team in a strict salary-cap sport. The optimism is thick and full of delusion. It isn’t helped by the daily write-ups from other fans preaching the excitement of a total success rate in the assets acquired. All 5 first rounder selections over the last 2 drafts will become impactful players, building blocks, etc etc.?? It isn’t possible. no team has had that kind of success in drafting regardless of the sport. U get it Baron. The Ranger brass are pushing their Koolaid on us, because of their ineptitude at building a good team. They are getting buy in on this rebuild, when it really is a clueless attempt to save money and rid the team of good players. The draft may get us some nice young fun players, but not a playoff calibre team. We will be a bottom dweller for years and years. Come to the realization that we are not and will not be good for at least 5 more years. By then Gorton and Sather will pass the torch to someone who knows how to build a team. We are really DOOMED. well at least you can thumbs up each other. Can we clone Coach Quinn and send Q#2 down to coach the farm team? Someone get JOBU some Rum, we’re gonna need some juju placed on this lottery boys! Notable prospects in the system, but still in college, Europe, or the minors: Morgan Barron, FW; Yegor Rykov, D; K’Andre Miller, D, Vitali Kravstov, FW; Nils Lundkvist, D; Joey Keane, D; Nico Gross, D; Igor Shesterkin, G; plus Hajek, Lindgren, et al, in Hartford. Considering that we still have a number of other players we’ve already drafted, plus this year’s draft to add, plus whatever trades or FA pickups we can make, I’d say the future looks promising, at least. Or you can say that every team has young talent all over the world and our talent cannot even make our AHL team a playoff team. We have warm bodies who can skate, but that is about it. We may have a top 10 ranking of farm systems, but then why is our AHL team so bad? Because we choose stupidly. Out of the list of players, maybe 2 will have an NHL career of 2 years. The rest may get a cup of coffee at the NHL level. We draft horrendously and this is our problem. We think we are smarter than everyone else, but we are clueless. It is embarrassing to be a NYR fan right now. Its nice that you can name their prospects…but are there any bona-fide sure things on that list? Yes, Miller looks good; Shesterkin also…but the rest? They’re babies!! And I don’t remember any of them being rated as that A class player that will become the face of a franchise. They could very well be some valuable complementary players…but IMO, that sure-thing, impact future star caliber player, is not yet in the Org. And unless they get themselves in position to draft in the top 3, he ain’t coming through the draft. Dolan, last week, said that they’ll have lots of cap space this summer, and they will try and use it on some “very interesting free agents.” I really believe they will target Pinarin, and kick the tires on Karlsson….for better or worse. Well noted! The Rangers do not have an exceptional prospect pool. It compares very favorably with the recent past where they were always near the bottom, but a shade above average (where they are now) is not a certain ticket to a Cup. Maybe they will be top ten or top five after the draft, but there is still a long way to go. You don’t know that and that’s the case with most organizations. We’ve seen way too many highly touted can’t miss prospects picked from say #3-10 that never really pan out as elite … and then there are those late 1st rounders that blossom beyond expectation. We’re talking kids here, guys getting drafted at 18. There’s a long road from 18 to 25. 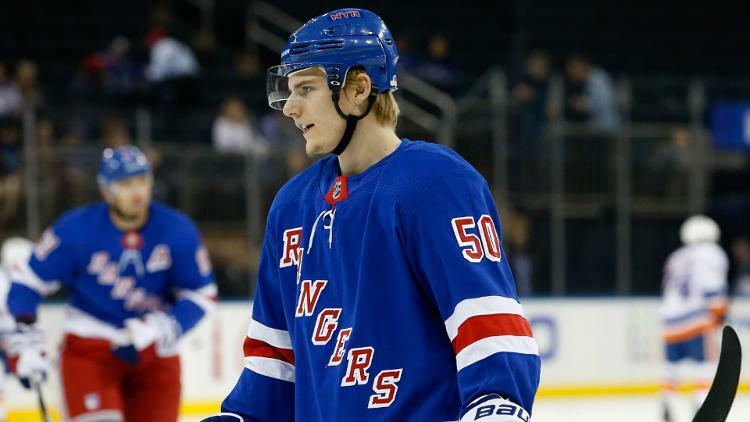 For all we know guys like Kravtsov, Miller and Shesty may all turn out to be elite by the time they hit their mid-20’s … maybe you can add Chytil to the list, I mean the kid looks like he couldn’t grow a playoff beard right now if his life depended on it. If just half the aforementioned guys turn out to be elite that will already be an embarrassment of riches for us … and there’s this years draft … and maybe ADA turns into an almost elite offensive d’man. If just half??? Zero out of ten is considerably more likely than half. Elite is a pretty high bar and if the Rangers get 2 or 3 elite players out of the ten Joe mentioned management would be jumping for joy. A reasonable hope is a half dozen players who can have an impact, one or two of whom are elite players. Look at Lundqvist for example. Right handed defensemen are so valuable the Oilers gave up Taylor Hall to get a good one. He may turn out very well, but there is no way a “can’t miss” RH defenseman survives until near the end of the first round. Not saying his ceiling is not a top pair guy, but he simply can’t be a surefire top four guy. And everyone won’t hit their ceiling. Half of the 4-5 I mentioned. Chill Brother Ray, chill. The reason we won for so long prior to the rebuild was because we had good players throughout the lineup … as you might say players that have some positive impact on the game … plus 1 elite goalie. I’ve never subscribed to the gloom and doom associated with not having 2+ elite players on one team. I believe in quality throughout the lineup — you can win with average 1st and 2nd line players if your 3rd and 4th lines are better. Character (mental toughness) and a good structure combined with basic quality can go a long way. You don’t need elite players per se, you need players that can match or play better than the other team when it counts. Elite players can be somewhat contained if you play properly, in that case the question comes down to whether some 3rd or 4th liner is going to beat you — or if your own coach (ahem AV) beats you. Sorry about the confusion. As the thread started with a list of ten, I thought you were referring to that. We agree in part. I think having more impact players compensates for the absence of elite players. The great success of the Brassard-Zuccarello-Pouliot line stemmed in part from the fact that teams could not stop them if they also tried to stop the top two Ranger lines. McDonagh at his peak could stop any single player, but he simply could not play all the time. However, you do repeat one common misconception. Alain Vigneault was an excellent coach and he NEVER NEVER NEVER had the benefit of an elite goaltender. Hank was elite 2005-2013 and has been a shade above average since then. It is my belief that many of the poor choices made by the Rangers can be ascribed to the failure to realize this. For example, if you understood that the McDonagh-Girardi-Staal-Stralman combo was perhaps the greatest defensive quartet of all time (excluding all quartets which contained Bobby Orr), you don’t let Stralman walk. OTOH, if you think your goalie is carrying your defense, you don’t want to give rich contracts to everybody. JFTR, IMO, the Rangers were right to dispense good contracts to Lundqvist, Staal, Girardi. The Girardi contract turned out well except for the idiotic buyout. The other two did not, but the problem with Staal was injury and that is how hockey goes. And there was no way to have foreseen (IMO anyway) Hank’s decline. They just needed to hand out one more. AV was brutal in the SC final (that is what I was referring to) … and then the NHL decided to add some atrocious calls against the Rangers that I believe cost us a real opportunity to beat a tough LA team. I don’t think AV was a bad coach overall and was good, especially in the first couple of years. However over time I think he changed the team’s identity — and not necessarily for the better. Agree about Staal, his issue is the eye injury more than anything else. He was on his way to being a great d’man, even after the concussion levied on him by his dear brother. Girardi if utilized properly could have lasted through his contract — and they would have been better off retaining half his salary and trading him as opposed to buying him out. I agree, that was a huge mistake … and although I understood where the FO was going with Dan Boyle over Stralman (sacrificing a little d’ for some more o, especially on the PP) I always loved Stralman and wanted him signed long term prior to his free agency year. He wasn’t spectacular but he was the perfect 2nd pairing guy, a stud in that role. Boyle on the other was a year to old before we signed him, a typical error we seem to make with UFA’s. Re: Hank I think he was still elite past 2013. I think his decline coincided with the team’s decline. NYR will probably finish this year with around 74 points. My question is, next year, more or less? That’s a good question. Depends in part on whether or not they sign a guy like Panarin. Regardless, they’re better team than what they’ve shown us in the last 4-5 games. I say more, but by a hair. People can’t forget all the guys we’ve traded, you don’t replace the production of mature players like Hayes, Nash, Grabner, Miller, Zucc, Stepan, etc. by just plugging in a bunch of young kids. It will take a few years. I do not understand why Dave has a mean eight year old writing posts for BSB (surely no nine year old Ranger fan knows so little about hockey). Marc Staal has been a great player for the Rangers, he has given his all and will never be the same because of it. Taking meaningless shots at him is just a confession that the world would be a better place without people like you. And the inanity. Signing Jake Elmer is at least as reasonable as signing the MVP of the Swedish Elite League, really? Derek Stepan as a low end estimate of Lias Andersson? I know I shouldn’t have read this, but I was bored today. I do not understand why I have an angry old man yelling at a cloud on my blog. Yet here we are. Pat’s post was very even keeled and well thought out. It’s unfortunate that you, the angry old man, took his very obvious jab at social media trolls who complain about everything online as complaints of his own. Most people would have been able to read those last few sentences of the first paragraph and recognized thinly veiled criticisms of those who complain about everything. But you clearly missed it. What does that say about you, who thinks the world is better off without a little light-hearted humor? What does that say about you, who cannot recognize that you can criticize a player on the ice for his current play while still also appreciating what he has done for the team in the past? Long have we said Staal is not the player he used to be, and that contract is a bad contract. What does that say about you, someone who needs to take a shot at someone he’s never met because he’s mad online? Well said, Dave—Ray’s meds need to be adjusted or something along those lines. Let’s start with the fact that I really didn’t notice the first paragraph. I am not at all interested at all interested in social media and so most of your second paragraph and all of numbers 3 and 4 are not germane. I was reacting to the fifth paragraph. And I was not just reacting to this post – but to a twofold history. There is a difference between saying that someone is not very good and saying that they are a traffic cone. Referring to the defense as a tire fire is likewise insulting. There is a difference between criticism and insults. I have pointed out time and time again that Henrik Lundqvist is no longer elite, but I also treat him with respect. And the fact that everyone agrees that Staal is bad just does not make it true. He is a stay at home defensemen, something you choose not to value, and he is no longer capable of being an effective first pair guy. The second issue – and I even acknowledged my error in my original comment – is that nearly everything Pat ever says is wrong. You and I disagree frequently, and at times I find you unreasonable, but you are strongly committed to the Rangers and your reasoning does evolve. Whereas Pat just wrote a series about worst case scenarios – worst case scenarios meant management doing things he/she disagreed with – you understand that you honestly don’t know what the right path is – you just have your perspective. I know I should not read Pat posts and resolve to avoid them in the future, but I do read this blog and they are there – and sometimes there are interesting comments. Change the word Staal to Lundqvist and pretend the last three paragraphs are aimed at you. Fits you as well as me, doesn’t it? Finally your first paragraph: fair enough, I apologize. The bottom line is this: For years the Rangers traded away picks for one more try at the cup. That short-term thinking starved their AHL team and system of talent. They are restocking the farm and will continue to do so this year, and probably the next as well. It has to be done. Some of the kids they pick will make it to the NHL, others will be career minor leaguers. They need a strong development team in their farm system and I suspect that they do not have that presently. That needs to be fixed or they will not get the most out of their draft selections. Sorry, but Lias is closer to Manny Malhotra than he is to Derek Stepan. Andersson either goes home this summer and somehow lifts his game more than a few notches, or I don’t believe he’s ever going to even be solidly in the middle-6 here. I’m done predicting what they will do. How about just watch and see? Cause we watched to many blunders the last 20 years ? Its always a crap shoot , well most years. Unless u throw the obvious guys that will make a huge difference in ur francishe the second you draft em. You think these top 3 will make huge gains or still gonna be a roll of the dice? Well, I was right about Hayes, though there were a lot of mixed signals for a while. It would be wonderful if the Rangers got in the top 2 of the draft. But, usually, we cannot have nice things, as Ranger fans. Hayes is a big man who plays soft . Does lots of good things but can be flat lazy lazy lazy. Did we need to sign him for that crazy term and money he was wanting ? Hell no . I haven’t really heard much about him with a pretty stacked team. Remember how many times I said he was dogging it, especially when the contract negotiations weren’t going well. Mint went nuts and defended him to high heaven, only to find the team was more in line with my way of thinking, rather than his. He is lazy, dogs it, and isn’t worth his current contract, let alone what he wants long term. Bottom line, I’m glad to see him gone!!!!! On a side note, where the hell is Mint, we haven’t heard from him since the trade. I always suspected he was Hayes’ agent. LOL!!!!!!!!!!!!! !